As well as offering top quality kitchens, we have a large selection of Kitchen Accessories to complement your kitchen. We recognise that people like to see colour pictures of products they're looking to buy, so we've put this page together to facilitate that desire. Each of the items you see here can be ordered at the same time you order your kitchen cabinets. You'll find them, along with prices, when viewing units for any of our ranges. Alternatively you can simply contact us with your requirements and we'll place the order for you. 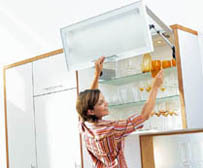 The Vertical Bi-Fold unit is fitted with the Blum Aventos HF system, fitted for perfect motion. All Blum fittings are guaranteed against normal wear and tear for the lifetime of your kitchen. Click to see Blum technical info for this unit. The Vertical Bi-Fold Unit is available in all ranges and in different door configurations to suit your requirements. Have a combination of a solid and a glazed door, two solid doors or two glazed. Whatever your desire for your kitchen, we can fulfill it. 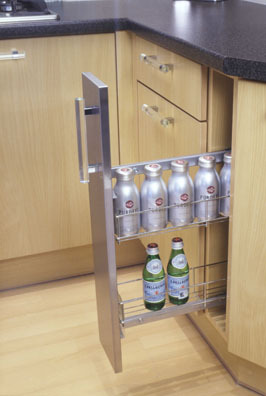 You can even opt for a Stainless Steel Plate Rack to be included. Click on the image above to view some of the door combinations, prices and sizes for these units. 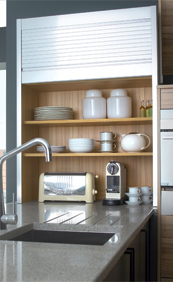 Tambour Dresser Units add a modern touch to your kitchen design; combining functional storage with contemporary style. The Stainless steel finish roller shutter, with integrated handle, is easy to clean and comes complete with a strong, reliable mechanism. 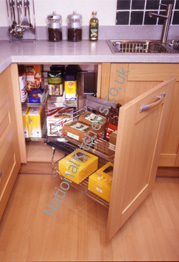 The fully assembled unit is supplied matching the rest of your kitchen. 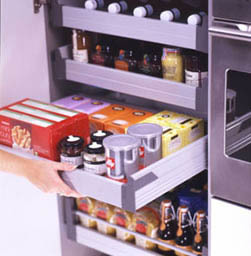 A wealth of storage and pull out kitchen accessories are available here. In both Base and Tall Units we have varieties and sizes ranging from 150mm wide Pull-outs, to Tall Larder Swing-Out and Pullout units up to 600mm wide.